HCP isn't a high-risk REIT, but it isn't bulletproof either. I've written before that healthcare real estate is a great long-term investment. Not only is it an inherently defensive type of real estate, but the market is expected to grow tremendously over the coming decades. One healthcare REIT that I own in my portfolio is HCP (NYSE:HCP), which I feel is especially solid after a major portfolio transformation in 2016. However, it's important to be aware of risks before investing, and here are three that HCP investors should know about. The reasons to invest in healthcare real estate for the long term include the expectation of soaring demand, especially for senior housing properties, HCP's bread-and-butter. Specifically, the U.S. population is aging rapidly. The 65-and-older population has grown by approximately 20 million since 1980, and is expected to roughly double from the current level by 2050. However, this does create the risk that the projections are a bit too optimistic. If these are revised downward at all, it could be seen as a negative factor by the market. And even if these projections prove accurate, there's also the risk of an oversupply situation as more senior housing properties are constructed to meet the expected demand. In a nutshell, whatever the cause may be, if the vacancy rates of HCP's properties rise, it could hurt HCP's bottom line and cause the stock to drop. Of these risk factors, the most likely to happen in my opinion, is the effect of rising interest rates of REITs in general. Since the Federal Reserve is anticipating three rate hikes in 2017 and several more in 2018 and 2019, this is a risk all REIT investors should keep in mind. For starters, rising interest rates make it more expensive for REITs to borrow money. I wouldn't call HCP a "high debt" REIT, but it does rely on its borrowing ability for growth. Rising interest rates lead to higher borrowing costs, which in turn generally lead to smaller profit margins. In addition, when rates rise, income-seeking investors tend to flee "riskier" assets like REITs, in favor of more stable income-generating options like Treasury bonds. Think of it like this -- when the 30-year Treasury yield is 3%, a 5% yield from a high-quality REIT like HCP may entice income-seekers to take the additional risk. However, if the Treasury yield spikes to 5%, it may not seem so appealing. So, REIT share prices tend to fall when rates rise to compensate investors for taking on the added risk. You can see this concept in action in this chart of HCP's stock price and the 30-year Treasury yield over the last several months. Notice how they move almost exactly opposite one another. The lower stock price further hurts the REIT by increasing its cost of capital when issuing new equity. REITs have two main methods of raising capital -- borrowing money or issuing new shares. Let's say that HCP is trading at $40 per share and wants to buy a $10 million property. From an equity-issuance standpoint, it needs to issue about 250,000 new shares to raise the money. If the stock price falls to $30, it now needs to issue more than 333,000 shares to make the exact same acquisition. HCP, like many REITs, bases its business model on establishing relationships with tenants and operating partners. Most of HCP's portfolio is leased to tenants on a triple-net basis, but about one-fifth is operated by HCP along with partners. While HCP got rid of its riskiest assets in 2016, it does still rely heavily on a few tenants. Specifically, 64% of the senior housing portfolio is operated by Brookdale Senior Living, including most the operating partner portion. To be clear, I'm a fan of Brookdale Senior Living as a company. However, my point is that if Brookdale (or any other major HCP tenant/partner) started having serious financial difficulties, it could trickle down to HCP. HCP realizes this, and one of its current priorities is to reduce its Brookdale concentration, but it is and will remain a significant risk. All of these could certainly happen. We already saw what operating partner weakness can do to a healthcare REIT -- HCP's stock got crushed when its HCR ManorCare portfolio of properties caused a surprise loss early last year. 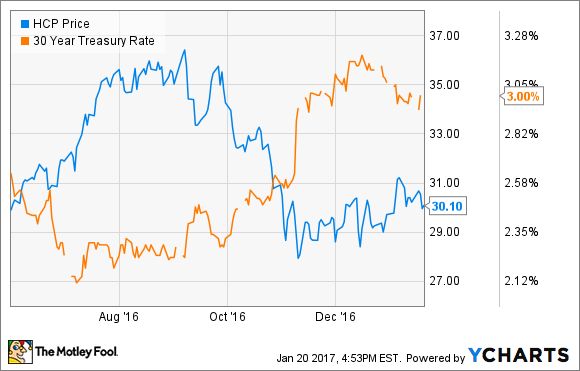 And, interest rates were the main reason most REITs performed poorly in the latter half of 2016. However, any weakness in the share price should be short-lived. Over the long term, HCP's business model is designed to produce consistently strong returns, so if you're invested in HCP, don't panic if say, interest rates rise and the stock falls. On the other hand, any drop in the share price can be viewed as a buying opportunity for those focused on the long haul.